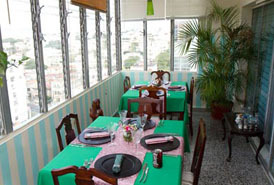 Just around the corner from Hotel Presidente you´ll find Castas y Tal situated on the 11th floor of a large apartment building in Vedado, just around the corner from Hotel Presidente. The restaurant has three areas, a main dining room that can seat eight, an indoor terrace with glass windows and a side area where you can have an excellent caipirinha prepared with eau de vie (fruit brandy), and caipiroska (with vodka). This is not a slick mega-paladar but a homely lounge. A young Cuban entrepreneur Jonathan Reyes and chef Ransys Valdés knows and loves her food. With a German grandmother, Chinese uncle and various Spanish relatives, she has plenty of influences. The food is light, fresh and healthy. Croquettes, tapas and Spanish omelettes are delicious but do not sit like a lead balloon in your stomach. Everything possible is made in house. Several dishes are special recipes of Ransys: cordero casto is boned lamb cooked with masala spices; pollo y tal (boned chicken with vegetables in pineapple juice and ginger); shrimps in rosemary sauce; and roast beef in mushroom sauce. You have to try the Piso 11 dessert – French bread with eggs, red wine, vanilla ice-cream, hot chocolate and ginger. Standard Spanish and Chilean wines should be available.